About Eighty Attend Teachers Seminar Moli. About eighty teachers attended a week seminar that was facilitated by Fr. Joe Ensing and Sr. Brenda Nash from Papua New Guinea. The seminar was held at Moli pastoral center St. Joseph parish, Choiseul province. Lawrencia Miruku from Paparakakasa, St. Dominic Parish Sirovanga was one of the participants who have an opportunity to attend a very important kindergarten teacher seminar that was held at St. Peter’s parish Gizo on the 11th – 13th July 2017. Lawrencia has been enrolled by her community for almost 2 years and has been a model for caring the 25+ children in her community. Lawrencia who is an old untrained teacher but by her experience as a young talented mother, and by the help of other untrained teachers and her community she has an enthusiastic to carry on her role as a kindergarten teacher in her community. Catholics Gizo Complete 3 days’ Seminar for Kindy Untrained Teachers. About 30 kindergarten teacher participants from the Catholic diocese of Gizo have successfully completed a 3 days’ seminar which commenced on the 11th – 13th of July 2017. Participants were from Gizo parish and from Wagina, Moli, Voruvoru and Sirovanga parish in the Choiseul province. Ms. Paolo demonstrate on some of the playing kits. Diocesan Secretary explain on to one of the participants, while a St. .Peter's kindy supervisor looks on. Participants with their certificates and the facilitators during group photo. A 3 days training seminar mainly to equip the kindergarten unqualified teachers to analysis some of the initial situation about the children in the class, this includes identifying the psychological characteristic of the children between 3-6 year of age, literacy, mathematics and management and emergency in the school. The training may also enable teachers to bring the children more closely to the moral teaching of the Catholic faith. During this seminar, Bishop Luciano Capelli sdb has the opportunity to give a session on the importance of the work they are doing with children back in their schools. He congratulated them to have made this initiative living their family behind and made it to this seminar. He stressed also that teachers should care about the children who have come for them to be educated, and promised them to equip their school with resources. The seminar involves different facilitators who take a turn to facilitate the types of activities which includes questions, comments, demonstrations, group work, discussions and presentations from the participants. Facilitated by the Italian Volunteer Ms. Paolo, supervisor and teachers from St. Peter’s kindergarten Gizo and the Diocesan Secretary Ms. Wryne Bennett. The seminar ended successfully with the handing over of the certificates to participants. New Filipino Teacher to Serve Don Bosco Secondary School Nila Shortland Island. A new foreign teacher to serve Don Bosco secondary school at Nila Shortland Island was welcomed at Nusatupe Airstrip. She is Madam Mariter Mayor Alamil, 51 from Filipino arrived in Gizo on Monday the 1st of May on the feast day of St. Joseph the worker. She served as a teacher in the Philippines and handled classes in Christian living education and in guidance, mostly in secondary schools. Last year she taught humanities and world religious in the senior high school, and left for Solomon this year 2017. Madam Mariter belong to a large family with 2 brothers and 7 sisters, all alive and the eldest brother died when Mariter was 4 years old. Both her parents dead, mother in 2000 and her father in 2013. When I asked Mariter, what is her expectation, she said that she really don’t have much expectations, but what is within herself is the excitement and the desire to be with the people of Solomon Islands, particularly in Nila, and be a part of their learning process. “I am here to serve and to love, all for God’s greater glory”, said Madam Mariter. Two of the key priorities for Solomon Islanders have consistently been Education and Health. From the earliest days, the Churches put a lot of effort into these areas and established Schools and Clinics throughout the Provinces. Eventually, the Solomons Government took over many of the schools (but not Kindergartens). Recently, this has potentially changed yet again so that now, the Government wants Gizo Diocese to take back the running of a number of schools. This presents a formidable challenge, particularly in the provision of resources. Updating and constantly upgrading personnel and techniques is very important and increasingly the world is focussed upon Information Technology ("IT"). Hence, in collaboration with the Sydney Catholic Education Office, the Diocese of Gizo has set up its 'Education Resource Centre'. The centre - recently completed - is to provide a clean, quiet and airy space for teachers and animators to attend Seminars and Workshops. Part of the plan yet to be realized - is a well equipped computer room with LAN connections designed to allow the teachers and animators to become computer literate and have access to the internet and assorted other IT resources. The building is complete and in use. Wiring of the LAN facilities and linking to the Diocesan Office via Wireless LAN Link has been accomplished. All that is needed is the donation of a number of computers in order to run training and familiarisation courses. It is hoped to recoup some of the running costs of the Resource Centre by renting the facility for external training and/or running a part-time "Internet Cafe" when the Centre is not being utilised for its primary purpose. Written by Bishop Luciano Capelli sdb. set of 18 graduates on Friday the 30th of October. 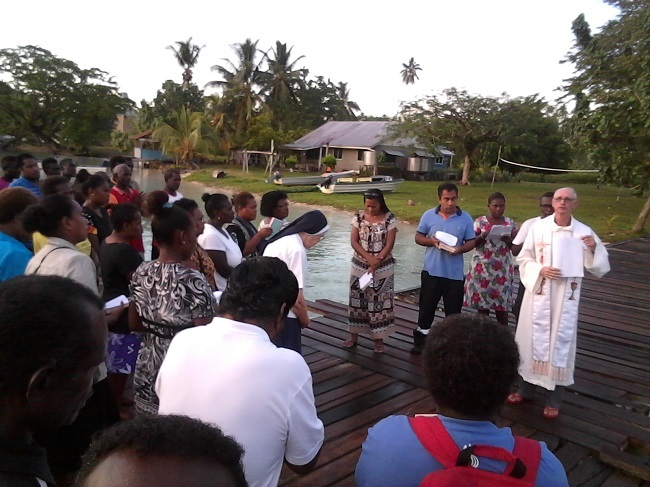 The catholic Education authority of the Gizo Diocese has renewed its commitment, competence and dedication to train good mentors for the youth of the country. Two general superior sisters visit Nusabaruku. Two general superior sisters (mother General Maddalena and her vicar Noemi) from the congregation of the Servants of the Visitation visited our Diocese from February 22 up to march 1. The visited Gizo, Loga, Vanga, Fishing Village and Nusabaruka. They are happy to come and stay in Nusabaruka, with the people to assist them in their needs. They will send Two sisters in September (one nurse and one teacher) and two more in January 2019. They showed us an example of joy, humility and availability to be with the poor and help them like Mary as she visited Elisabeth. The fear of the 29 Bouganvilleans around Gizo did not stop them from visiting the people. Sr. Noemi and Sr. Maddalena were very glad to visit the children and their teachers. The Sisters told the children that they are like Mary, live like Mary and travel like Mary to visit far away communities. They said that when they arrived here they found joy and happiness, as Mary was filled with joy when she visited Elizabeth. Accompanying them were the three Salesian Sisters: Anna, Regina and Joana (FMA) who now run the St. Peter’s Urban training center in Gizo. Caritas Italy, Japan and Australia have recently donated a significant amount of money in order to replace the inboard diesel engine of the M.VFrank. The Frank is used by the Vanga Rural Training Centre to transport people and supplies, mostly between Vanga (which is on the Western Coast of Kolombangara Island) and Gizo. Here we see the re-engined Frank motoring on Gizo Harbour. In the other photograph, Brother Max proudly displays the new engine.